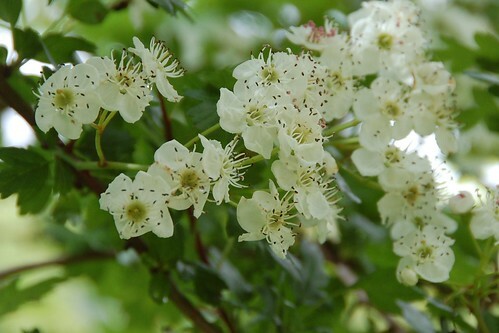 May or Hawthorn is the flower of choice for May Day, celebrated on the first of May, that favoured festival of spring with dancing, drinking and the promise of young love. But the machinations of clerics and bean counters changed the dates in 1752 and brought the 1st of May forward 13 days, so that the May flowers are now always late to the party. This year they've almost missed the month altogether and although the weather is slowly beginning to move into warmth it seems that everything is still delayed by a good two weeks. This probably won't matter much if we have a long slow golden autumn but if winter comes quickly then a lot of crops won't have time to mature - which here will mean no long keeping squashes and maybe no sweet corn despite it having just been planted out. There may not be any dried beans either. Seed for next year may not be viable. It's not a matter of much concern yet, we're by no means self sufficient anyway, we'll just have to buy a little more but if we were dependent on our crops a few more years like the last few would see us on the verge of starvation. It seems odd to think that famine might visit the affluent west but it's only half a dozen poor harvests away. Today I planted out the Yacon and the Ulluco, fancy goods that barely make a return to the stores anyway, just folderols and fiddlefaddles in the great scheme of things even if they do hold promise for the future. I also put in some Irish Prean peas seedlings but hardly enough to make a seed store for next year and some Achocha, another novelty. It might be said I'm not trying very hard. But there are bean plants waiting their turn, several squashes are now germinated and a few weeks of warm weather will see them advance rapidly. The tomatoes are in the greenhouse and beginning to set fruit. Nearly all the seed potatoes are bedded too, and the spares might just go to waste if I can't find more space for them quickly. I'm hoping to make the first harvest of earlies in just a week or two. The forecast is set for 10 days of dry and steadily increasing warmth. I'm keeping my fingers crossed for summer.